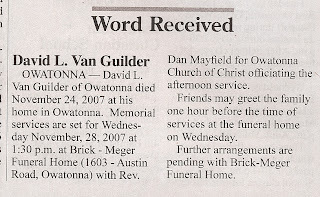 David VanGuilder was our friend. 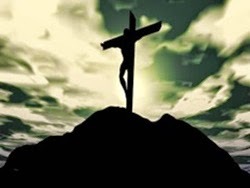 He was dedicated to the Truth, to the Lord Jesus, to his daughter, and to so many things. The memorial will be in Owatonna, MN at the Brick Meger Funeral Home. Time for visitation is 12:30 and memorial is at 1:30. I hope you can attend. 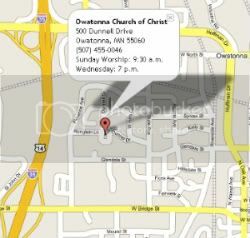 After the memorial, food will be served at Dave's home, 1390 Clover Ln, Owatonna, MN. The church in Owatonna will provide this in his honor. He passed away at home at the young age of 49. He loved the truth and sought after it all of his life. The church was home to him. He was a fixture in the church for many years. Dave will be missed so, so much. I need your help. If you have a special photo of Dave, please send it to me ASAP. I prefer to have it by email, for speed, but if you have a print your can share, send it and I will scan and it to the collection you see here.